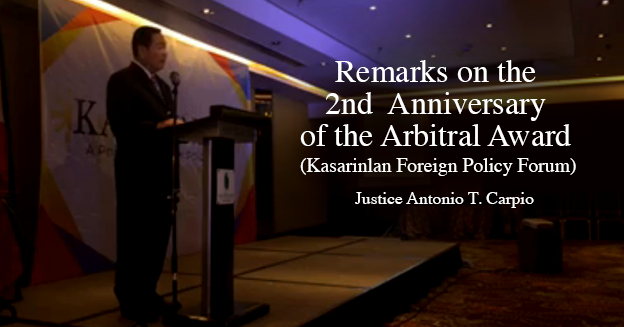 The Award issued by the Arbitral Tribunal at The Hague on July 12, 2016 stands today as the most important decision under the UN Convention on the Law of the Sea or UNCLOS. The Award has great ramification worldwide because the Award expands immensely the global commons in the oceans and seas of our planet by denying exclusive economic zones and extended continental shelves to small islands that cannot, solely on their own natural resources, support a stable community of people. Thus, the Award recognized only a 12-NM territorial sea to Itu Aba, at 46 hectares in area the largest island in the Spratlys. The Award expressly denied to Itu Aba a 200-NM EEZ and a 150-NM ECS. Hundreds, if not thousands, of similarly-sized islands dot the oceans and seas of our planet. Today, states that used to claim expansive EEZs and ECSs from these small islands can no longer do so because of the Award. The result is that there are now far more high seas in the oceans and seas of our planet. The waters and fish in the high seas, as well as the mineral resources beyond the extended continental shelf, are part of the global commons, belonging to all mankind. In short, the Award has greatly expanded the global commons for the benefit of all mankind. For the Philippines, the Award means that the Philippines has a full 200-NM EEZ in the West Philippine Sea, excluding the territorial seas of islands and high-tide rocks which remain in dispute since an UNCLOS tribunal has no jurisdiction over territorial or sovereignty issues. The maritime area that the Philippines won in the arbitration is larger than the combined land area of all the islands of the Philippine archipelago. And, of course, all the fish, gas, oil and other natural resources in this huge maritime area belong exclusively to the Philippines. Now, has the Philippines enforced the Award considering that the Award is so obviously advantageous to the Philippines? Last December 2016, President Rodrigo Duterte declared that he was “setting aside” the Award to secure loans and investments from China. Thus, the President has refused to take immediate steps to enforce an Award that, by any conceivable yardstick, is immensely in the national interest of the Philippines. The President stated that sometime during his term of office he will raise the Award with China. That is, of course, the prerogative of the President as the Chief Architect of our foreign policy under the Constitution. That means the President may raise the Award with China anytime – between now and the day just before the end of his term of office on June 30, 2022. Under UNCLOS, there is freedom of navigation and overflight in the high seas and EEZs in the oceans and seas of our planet. This is where the naval powers of the world are enforcing a core part of the Award. Even as I speak now, a core part of the Award is being enforced by the naval powers of the world. The navies of the U.S., U.K., France, Australia, Canada, India and Japan are sailing, and have been sailing, in the high seas and EEZs of the South China Sea to assert freedom of navigation. The air forces of the U.S., U.K., Australia and Japan are flying, and have been flying, over the high seas and EEZs of the South China Sea to assert freedom of overflight. These naval and air operations enforce the part of the Award affirming the existence of high seas and EEZs in the South China Sea. This is the necessary consequence of the naval and air operations of the world’s naval powers in the South China Sea. Fortunately for the Filipino people, there is clearly enforcement of a core part of the Award by the world’s naval powers, even if there is inexplicable reluctance on the part of the Duterte Administration to enforce the Award. The heavy lifting in the enforcement of the Award is being done by the world’s naval powers with practically no support whatsoever from the Philippines, the state that overwhelmingly won the Award and the state that stands to benefit immensely from the enforcement of the Award. The Philippines has even declared that it will not take sides, between China on one hand and the U.S., UK, France and Australia on the other hand, on the issue of freedom of navigation and overflight in the South China Sea, even if these naval and air operations enforce a core part of the Award. The Philippines has incomprehensibly decided to befriend at all cost the very state that is grabbing the EEZ of the Philippines. Now, let me address four issues raised by people who oppose any Philippine action to enforce the Award. First, there are those who say, including President Duterte, that enforcing the Award means going to war with China. This is, of course, not true. There are many ways of enforcing the Award, or parts of the Award, without going to war with China. I have on many occasions enumerated these peaceful actions. War is not an option and has never been an option. Our Constitution prohibits war as an instrument of national policy, which means it is unconstitutional to go to war to enforce the Award. War has been outlawed by the UN Charter as a means of settling disputes between states – which means it is against international law to go to war to enforce the Award. Besides, it is only Congress, with the House and the Senate voting separately by two-thirds vote, that can declare war. I have not heard a single Congressman or Senator advocating war with China to enforce the Award. Second, there are those who say that arbitration is not a peaceful means of settling disputes between states, echoing China’s reason for refusing to take part in the arbitration at The Hague. The UN Charter expressly recognizes arbitration as a peaceful means of settling disputes. Moreover, UNCLOS expressly provides that in case of a dispute arising from the interpretation or application of the provisions of UNCLOS, any party to the dispute can generally invoke arbitration as a legal means of settling the dispute. Thus, arbitration is indisputably part and parcel of diplomacy. Fourth, there are those who say that the South China Sea dispute is a geopolitical rivalry between China and the U.S., and the Philippines should stay out of the fight between these two hegemons. Those who hold this view are totally blind to China’s blatant physical seizure of Philippine maritime zones and territory in the West Philippine Sea. China is not shy in publicly declaring to the world that it owns 80 percent of the West Philippine Sea under its nine- dashed line claim. No Filipino in his right mind can gloss over this obvious and indisputable fact. The core dispute in the South China Sea is China’s appropriation of the high seas which belong to all mankind, and more importantly, China’s seizure of the EEZs of the Philippines, Vietnam, Malaysia, Brunei and Indonesia. If today China abandons its illegal appropriation of the high seas and stops its unlawful seizure of the EEZs of these coastal states, there will be no simmering dispute in the South China Sea. Since the Duterte Administration has chosen to set aside the enforcement of the Award, the task of keeping alive the Award within our country has fallen on people like you and me. It is now our duty to inform the Filipino people why the Award is immensely beneficial to our national interest, and why every Filipino has a civic duty to preserve and protect the Award so that the next Administration can enforce the Award. It is also our duty now to inform the other peoples of the world, in particular the citizens of UNCLOS member-states, that China’s compliance with the Award is essential to the survival of UNCLOS as the governing law for the oceans and seas of our planet. For if China can appropriate for itself the South China Sea, then other naval powers can also appropriate for themselves their near seas to the prejudice of smaller or militarily weaker states. That will mean the collapse of the rule of law in the oceans and seas of our planet. What will prevail will be the rule of the naval canon. The 2nd anniversary of the Award on July 12, 2018 should reinforce our determination to preserve and enforce the Award for the benefit of present and future generations of Filipinos, and to preserve and protect the global commons in the South China Sea for the benefit of all mankind.